iVet® Professional Formulas are products manufactured by a company with over 30 years of pet food manufacturing experience. This experience includes the engineering and manufacturing of the cooking equipment used to make dry pet food. We have installed pet food manufacturing systems all over the world and have assisted many companies in the research and development of new pet food and treat formulas. This history has given us tremendous expertise in pet food and manufacturing technology and quality control. Our manufacturing campus in the Midwest includes not only our pet food manufacturing facility but also a human food plant, which is certified Kosher. Both facilities are Organic certified as well as being certified by the American Institute of Baking. iVet® Healthy Gourmet™ Canine Formulas contain only Whole Chicken Meat with no chicken or poultry by-products. Many national brands contain chicken or poultry by-product meal consisting of the heads, feet, and viscera of poultry. These are less digestible sources of protein. Because we use no by-products, iVet Healthy Gourmet Formulas offer excellent digestibility and less clean up after your pet. There's no wheat in our formulas because wheat is one of the top three ingredients in pet foods causing food allergies. Our diets contain whole grains like Rice, Oatmeal, and Barley, which are better carbohydrate choices to eliminate possible allergic reactions. Oatmeal is an excellent carbohydrate, fiber, thiamine, and vitamin E source but is not widely used in pet food due to its cost. Our formulas do not contain Soybean Meal. Soybean meal provides a less expensive plant source of protein. Whole meat is the best source of protein and creates proper amino acid profiles for canine nutrition. Soy ingredients also have a reputation as an allergen. iVet Healthy Gourmet Formulas utilize Chicken Fat which is the same quality grade used in human foods. This helps give the food the great tase dogs love. It also provides the essential fatty acids that are a necessary component of canine nutrition. We have guaranteed high levels of Omega-6 and Omega-3 Fatty Acids for excellent skin and hair coat conditions. 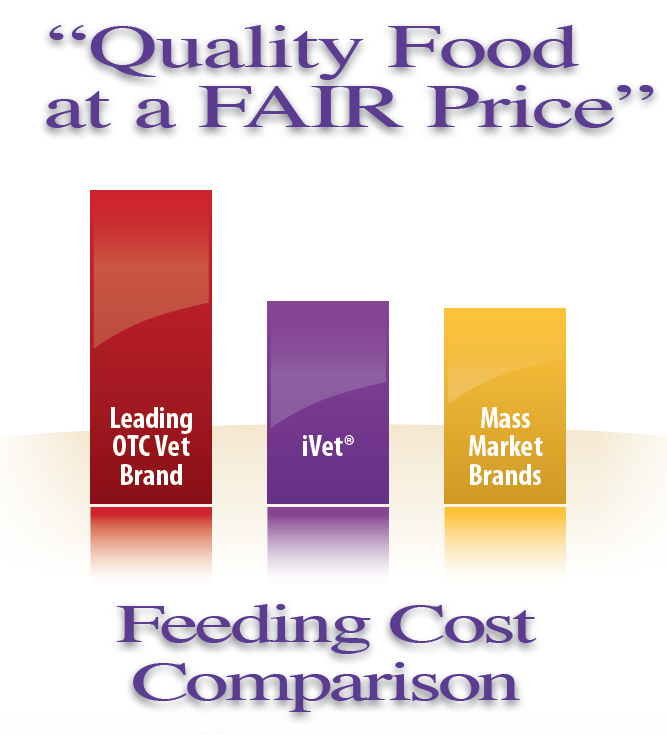 Our sources for our Omega-3 Fatty Acids used in iVet foods include Fish Meal and Flaxseed. Our iVet® Healthy Gourmet™ Feline Formulas, like our Canine Formulas, were developed with veterinarians in order to deliver veterinary quality nutrition for your cat. We provide your cat with nutrient dense ingredients necessary for long-term health and vitality. We use only whole chicken meat for our main protein source. This gives your cat the best protein and amino-acid profile along with the excellent digestibility. iVet Feline Diets are low in ash and magnesium to promote a healthy urinary tract and bladder with a balanced urine pH. Micronutrients including vitamins and chelated minerals are included at optimal levels to enhance the immune system. Omega-6 and Omega-3 Fatty acids are supplemented to promote healthy skin and shiny coats. iVet's Feline Adult Formulas contain all natural fibers, which help to move hair through the cat's digestive system therefore helping to reduce hairballs while promoting better gastrointestinal health. iVet® Professional Formulas were started by veterinarians for veterinarians in order to benefit your pet. We have created a superior quality product that your veterinarian can offer with the long-term health of your pet in mind. Nutrition plays a vital role in your pet's health and availability only from your veterinarian allows them to offer quality nutrition as part of an overall wellness program. iVet Professional Formulas offer a caliber of nutrition not available outside your veterinary clinic. While iVet is available only from your veterinarian, the cost of iVet is more reasonable than brands often associated with veterinary hospitals. Start feeding iVet today and begin realizing the benefits that pets and pet owners are discovering every day. Please call 402-466-1383 for more information.